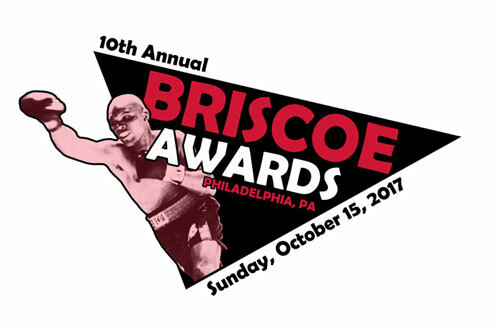 Undefeated welterweight, Jaron “Boots” Ennis will take home “2016 Rookie of the Year” honors at Sunday’s 10th Annual Briscoe Awards. In perhaps the best season for rookies in Philly’s long ring history, Ennis led a talented pack of newbies that included Christain Carto, Darmani Rock, Branden Pizarro, and several others. Ennis turned pro in April of 2016 and reeled off eight impressive victories, seven by knockout, before the year had ended. Throughout his rookie season, Ennis displayed enough skill, killer instinct, and star power to excite even the most skeptical of boxing fans. Currently zipping through his sophomore year, Ennis, now 15-0, 13 KOs, looks poised for a big future and has the Philly boxing fans excited. 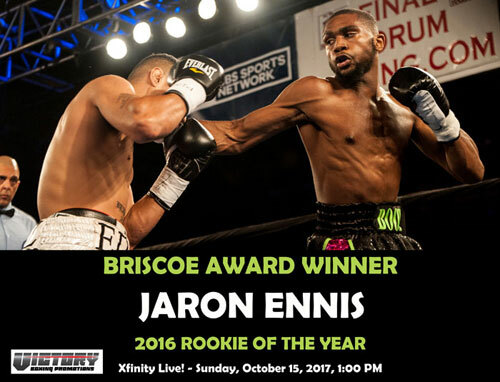 Ennis was the “2015 Amateur of the Year” at last year’s Briscoe Awards, and will be in attendance to receive his second Briscoe Medal. Ennis' "Rookie of the Year" award is sponsored by Victory Boxing Promotions.